DAYTON, Ohio –An economic impact analysis conducted for the Dayton Development Coalition by The Perduco Group found that Wright-Patterson Air Force Base, the Springfield Air National Guard Base, and the Dayton Veterans Administration Medical Center have a combined economic impact of $16.68 billion on the 14-county Dayton Region and generate more than 88,000 jobs. Direct Impact: Jobs and payroll at Wright-Patterson AFB, Springfield ANGB, and the Dayton VA. Indirect Impact: Business to business transactions and employment resulting from direct impacts. Induced Impacts: Employee spending on personal goods and services and the jobs supporting consumer demand. The results provide a detailed look at how federal installations fuel the local economy beyond direct spending. The study considered how employees and contractors spend money generated from federal employment and contracts within the community and the jobs that spending creates. 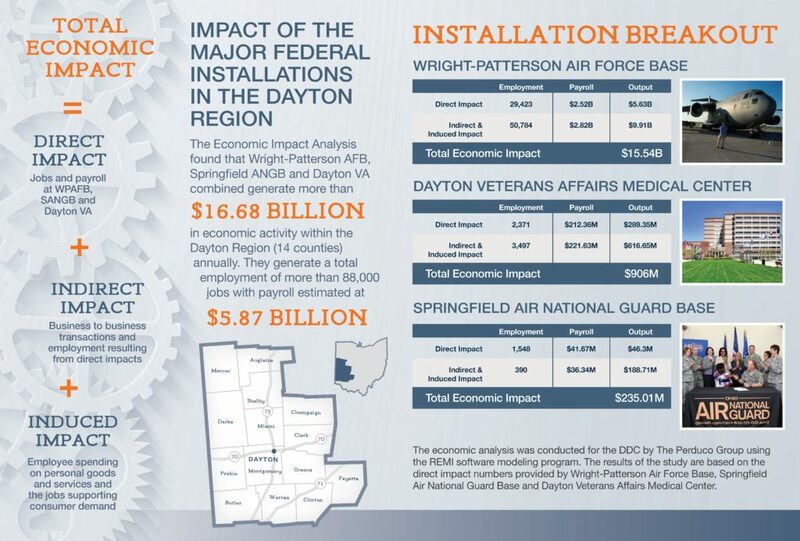 “This analysis illustrates how important these national assets are to the economic vitality of the Dayton Region and why our Congressional delegation, state and local leaders, and the DDC continue to support these installations,” said Maurice McDonald, Exec VP, Aerospace and Defense. Each installation periodically measures their economic impact but are restricted by government guidelines in the type of study that can be conducted. The REMI modeling software used in the DDC study allows for a wider view of the local economy, specifically the indirect and induced impacts that occur “outside the fence” and are vital to Dayton Region companies and residents. The included graphic shows the breakdown of the impact by installation, the type of impact and the and area studied.